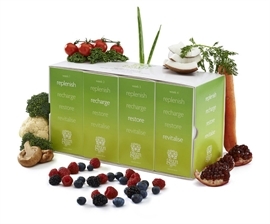 Here is the Signature Blend refill pack containing your next four weeks of sachets. This pack is for those who have initially purchased The Signature Blend starter pack (the Signature Blend System) and require the refill sachets to utilise their vortex mixer. Thank you for making Green Gate Signature Blend part of your daily routine. This powerful, life-transforming step will help you take your health to the next level. Green Gate Signature Blend provides serious nourishment to replenish your supply of enzymes. Specially formulated to fit the busiest lifestyle, this convenient blend of the world's most nutrient-dense, antioxidant-rich superfoods allows you to effortlessly awake, recharge, and revitalise your mind and body.